Hydrocarbon emissions result from the incompatibility of Stage II vacuum assist systems refueling vehicles equipped with ORVR (On Board Refueling Vapor Recovery) canisters. "Currently, Stage II vapor recovery efficiencies are being compromised by vacuum assisted systems returning excess air to the storage tanks and causing significant evaporative emissions of product," said ARID president Ted Tiberi. "Storage tank evaporative losses are also generated on non-Stage II sites, especially when fueling rates are slowed or interrupted due to normal cycles and business closing intervals. Hydrocarbon emissions represent a potential health and safety hazard for the public as well as an economic burden to petroleum marketers who will not be able to sell the same volume of product that they originally purchased. ARID's PERMEATOR system provides the solution to both of these issues." ARID's membrane CRU uses the same selectively permeable membranes which are used in ARID's Permeator system which is deployed at individual gasoline refueling stations. By using parallel banks of modules in conjunction with a larger vacuum pump, higher flowrate gasoline vapor streams are easily processed. 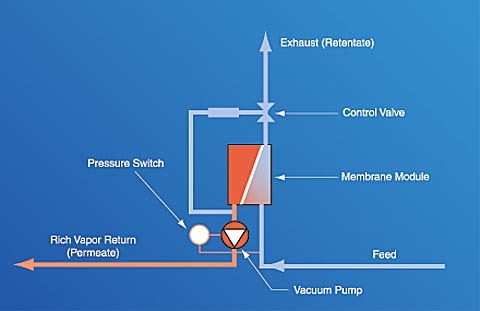 The ARID CRU routes the enriched vapors directly to the existing absorber (or "scrubber"), where the vapors are converted to liquid phase product and returned back to the bulk storage tank to be resold. "The use of the ARID CRU upstream of the existing carbon bed adsorption system allows bulk terminal operators to extend the life of their existing equipment while at the same time enabling higher throughput at the loading rack and reduced emissions of hydrocarbons to the atmosphere. With a renewed emphasis on operational efficiency and conservation of raw materials, the ARID CRU provides petroleum distributors with timely and relevant benefits," said ARID president Ted Tiberi. 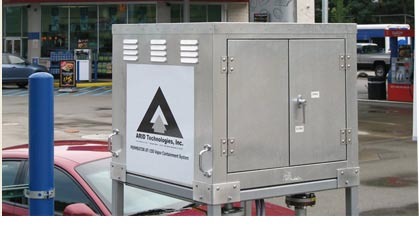 The ARIDAS-150 is a stand-alone monitoring and data acquisition system, which is used to measure vent emissions and pressure profiles from a fueling station. 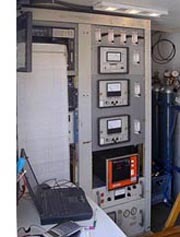 This equipment is used to characterize vent and fugitive emissions of gasoline stations operating under a wide range of conditions (for example, RVP changes in fuel, Stage II type, seasonal variations in ambient temperature, etc.). In cooperation with the company Scherzer, ARID has recently taken on promotion of the On-Spot railcar loading technology. The key aspects of this technology include an accurate load cell section of track for static weighing of loaded product to eliminate custody transfer issues with integrating flow volumes and temperature compensation into an accurate billing quantity. In addition, the On-Spot system allows for blending of multiple products into the same railcar (ethanol/gasoline blending, for example) as well as switch loading of multiple products into different rail cars in series configuration. 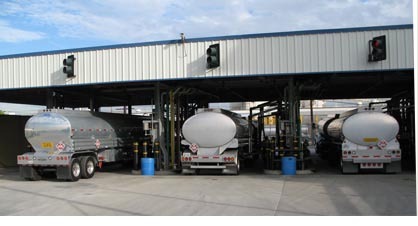 The On-Spot railcar loading system uses a specially designed railcar indexing system and a unique filler tube which provides high liquid transfer flow rates, automatic shut-off at prescribed levels, intensive safety management & control and integrated vapor return for routing displaced fuel vapors to ARID's membrane based vapor recovery system.